4G problems at Free Mobile with OnePlus 6? Try this one. The OnePlus 6 unveiled two months ago continues to occupy the media space. Yesterday, he received a new update that adds new features such as the integration of Google Lens in the camera, the addition of a beauty mode for the Selfie portrait function and more stability for Wi-Fi and mobile data connection at some operators. However, some users still encounter slight disconnections or problems with reselecting the 4G network at Free Mobile. If you are one of them, we may have the solution to your problem. In the" Define Preferred Network Type" section, select LTE/TD-SCDMA/UMTS instead of TD-SCDMA/CDMA/UMTS. On the left, the default setting; on the right, the new one. Your OnePlus 6 should automatically reselect the 4G network even after switching to 3G. On Twitter, users are generally satisfied with this manipulation, it remains to be seen if the solution is sustainable. We would also like to recall that the last update already corrects this problem in some situations. There is no need to manipulate these settings if you do not have any problems with network stability. 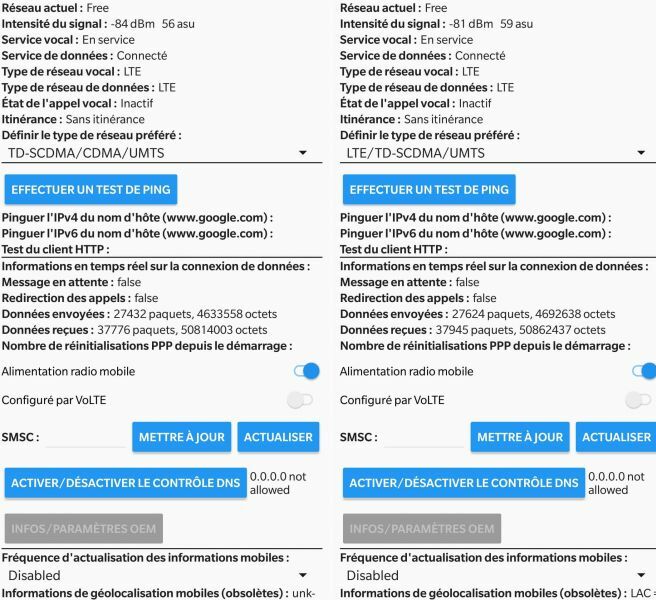 Leave a comment for	the article 4G problems at Free Mobile with OnePlus 6? Try this one. FoneLab - iOS Data Backup & Restore can help you back up iPhone/iPad/iPod and restore data from the backup selectively.